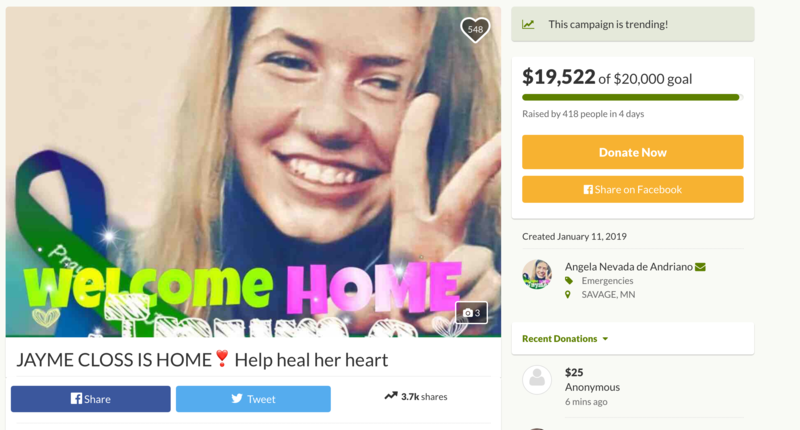 Donations from around the country are pouring in for Barron teenager Jayme Closs and her family in the wake of her abduction and the killing of her parents Oct. 15. Closs was missing for 88 days until escaping her alleged captor Thursday in the Town of Gordon. A Facebook fundraiser raised $51,000 in a matter of days after authorities announced Jayme freed herself from the home where she was held since the night she was abducted. A separate fundraiser setup Friday by Jayme's cousin, Angela De Andriano, on GoFundMe had a goal of raising $20,000 but donations exceeded that by Tuesday afternoon. De Andriano worked with GoFundMe to increase the goal to $50,000. As of 5 p.m. Tuesday, $20,157 had been raised. Donations have come from across the country, and messages of support are coming from around the world, De Andriano said. "I’ve had messages from Germany just saying, 'Hey, we are here. We’re so happy. Praise God. We are so thankful for your family and we really, really want to help out with Jayme’s journey.'" De Andriano said. "Because now, she’s got a huge journey ahead of her." People have asked De Andriano to keep the GoFundMe page open once the goal is met. She said she's looking into it. A fundraiser established by the Closs family at Sterling Bank in Barron has been accepting donations by mail since the October slayings and kidnapping. Branch President Aaron Weber said contributions have been steady throughout the nearly three months Jayme was missing, but they've picked up since news of her return broke. Weber declined to say how much money has been donated. "Now that it's hit the media again and it’s been a real positive thing, we’ve gotten a lot more support and donations coming in from locally and also from all over the nation," Weber said. Donations to the Closs family account at Sterling Bank can be sent to P.O. Box 70, 234 E. LaSalle Ave., Barron, Wisconsin, 54812. Both he and De Andriano have said they've received multiple questions about whether the fundraisers are real and tied directly to the Closs family. The financial and emotional support has been overwhelming and will help Jayme and her family heal, De Andriano said. "I think everybody can relate to this in some way because somebody has a child or a cousin or, you know, a sister or a brother," De Andriano said. "You know, everybody can relate to family and love and hope and loss and just rally together to make her journey at least not financially stressful." On Monday, 21-year-old Jake Thomas Patterson, who's accused of killing Jayme's parents — James Closs, 56, and Denise Closs, 46 — and kidnapping the teen, made his initial appearance in Barron County Circuit Court. Patterson is charged with two counts of first-degree intentional homicide, one count of kidnapping and one count of armed burglary. According to the criminal complaint, Patterson admitted to the crimes during interviews with investigators. He has since been moved from the Barron County Jail to the Polk County Jail. Patterson could still face charges in Douglas County for crimes committed while Jayme was held at his residence in the Town of Gordon. A Facebook post Tuesday by the Douglas County Sheriff’s Office said deputies have received reports of GoFundMe pages being set up to raise money for Patterson’s $5 million cash bail. The sheriff's office said the pages are being set up through fake or hacked Facebook accounts, including an account of a Gordon girl who is receiving threats online.